Annotated plan delivered to my doorstep by RaiseTheBalloon.com. Click for larger image. 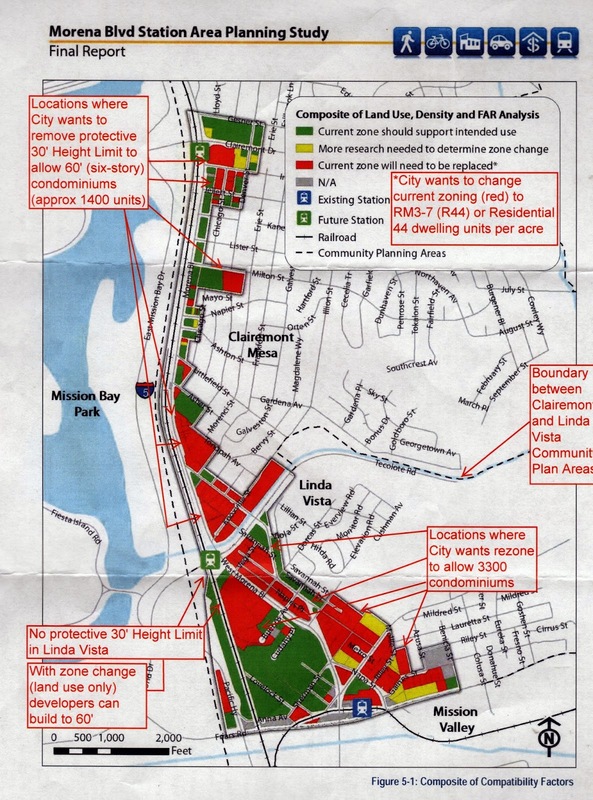 All the rezoning going on this city is designed for social engineering to get the subjects in line with the goals set by the state’s political elite. If you want to reduce emissions, the better path is through a carbon tax that increases incentives to use fuel efficient vehicles without severely disrupting the economy or the value of our homes. Of course, the left has never supported a carbon tax as a means to tackle pollution or climate change proving that their real goals are social engineering and socialism. The pressure being exerted on our neighborhood to carry the 3 trolleys and the proposed development could lead to unsustainable urban compacting, displacement of our elderly and poorer residents, and put an unreasonable strain on our infrastructure while clogging our routes into and out of (ingress and egress) Bay Park, Bay Ho, and the Mission Bay areas. We are encouraging the entire Clairemont Community to get involved and understand the issues. Please see understandtheplan.info for more information. Motor vehicle traffic lane configurations and capacity on each of the major and collector streets within the study area would remain essentially unchanged under the adopted community plan. Morena Boulevard (north and south of the two splits with West Morena) and West Morena would remain designated as major streets. Since major streets are to be designed to 45 mile per hour (mph) design speeds, existing travel lane widths and intersection designs are expected to remain. Traffic capacity enhancements would be limited to the planned extension of Knoxville Street as a 2-lane collector to West Morena Boulevard to provide a direct connection with the planned Tecolote station, while also allowing some motorists to avoid delays at the Morena/Tecolote intersection by providing an alternate route with a direct connection to West Morena. However, since there is considerable rush hour traffic out of Point Loma into this area, and no connection from Sea World Drive to West Morena, this does little to alleviate the foreseeable problems at the Morena/Tecolote intersection. (Tecolote is an extension of Sea World Drive). The CA Air Resources Board (CARB) is set to implement a cap-and-trade system for transportation fuel (gasoline) that will increase costs at the pump starting on January 1, 2015. Bet voters didn’t know they approved a gas tax with AB 32. Tank the Tax has the FAQs. Dalrock is great reading for a Christian interested in the intersection of our faith with modern feminism. He nails it again, pointing out the troubles from delaying marriage. KTCat has some advise for San Diegans diving the Point Loma kelp beds. This has absolutely nothing to do with “social engineering” by the state’s political elite. This has everything to do with money. The “sustainable” part means sustainment of bloated pensions and salaries. These laws are bought and paid for by developement interests and embraced by a govt. that requires massive growth at the expense of the residents’ quality of life. Some conservatives will cite these projects as another example of nanny state laws when in fact they are a reult of heavy lobbying by monied interests. Paul, I agree that special interests have hijacked the process for their benefit. This is normal. But the root cause is the sustainable communities process established by SB 375. That process is an explicit social engineering process intended to reduce your use of your car. Monied interests will always seize upon new government initiatives to either stifle competition or line their own pockets. Blaming monied interests for hijacking government programs is like blaming clowns for scaring children, its just what they do. My goal is to use every means possible to cause social engineering efforts to a halt so that my taxes don’t fund the already rich. 1. Mortgage interest tax deduction? 3. Making smoking illegal in indoor public buildings? 4. Additional tax on alcohol? 5. Additional tax on tobacco? 6. Making any drugs illegal? 8. Removal of lead from paint? No to all except 7 and 8. 7 is a maybe, because water is a good rationed by the government a monopoly provider and there is no good free market alternative, so non-market measures are required. 8 because there are network effects not borne by the buyer of the paint that harms others not involved in the purchase decision. Just like we limit many other sources of pollution. From an anti-social engineering perspective, I could argue with you about the lead paint. Instead of banning it, we could teach painters to use masks and children not to eat paint chips. That, however would be nitpicking since based on your answers to 1-7, you are consistent in your principals. I wonder how many people who say they are opposed to social engineering would have answered the same. Don’t you care about the fact that we are jamming more residents without making street improvements? I also note that we have attach no property rights to the view from one’s home, unlike Japan, so high rises become ugly political fights over zoning. Of course we should make the infrastructure improvements necessary to ensure that increasing density doesn’t mean decreasing quality of life. The question, as it is with so many issues, is how do we pay for it. Propose a tax increase and you will be voted out of office. Suggest that the developers, who will profit from the densification, pay any more in development fees, and the business community will start collecting signatures to have that thought overturned. 1. Can a region stop growing entirely and still remain prosperous? Can it even maintain a status quo and not start to deteriorate? 2. What did your neighbors think when your housing development was built? Were they ok with the increased traffic? Did any of them have their views obstructed? 3. Do you believe that from the day you move into your new home, you have a right to expect there to never be any changes to the surrounding community? 4. Where are your children going to live?